German Chancellor Angela Merkel (CDU) has rejected the criticism of the US Ambassador Richard Grenell on the plans for the German defense budget. 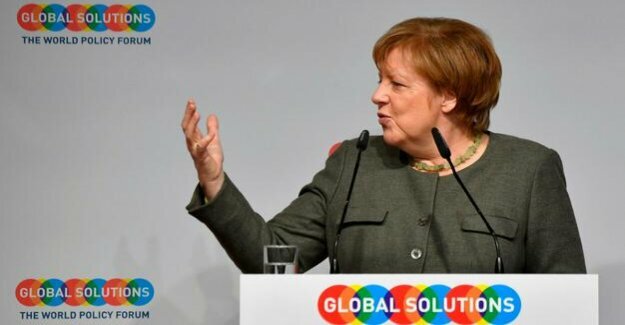 She wanted to back "a bit," said Merkel at the Global Solutions Summit in Berlin on Tuesday. Germany had increased its defense spending, step for step, and this will continue. Earlier, the US Ambassador had criticized the planned for the coming years the defense budget: "the Federal government is also in consideration to reduce their already unacceptable contributions to military readiness, is a worrying Signal of Germany in its 28 Nato allies", was Grenell said. The Chancellor referred to the fact that it is in the by the Ambassador objected to Pay only a medium-term financial planning. "The real issues are what is crucial, and which are always been revised upwards." It is a nonsense to only look at the minimal data. The budget plans of the Federal Finance Minister, Olaf Scholz, for the coming year, defence expenditure in the amount of 1.37 percent of gross domestic product. By 2023 this percentage would go to the medium-term financial planning to 1.25 percent. It referred Grenell with his criticism. The United States is calling for years that Germany is in the Nato agreed target, according to which the partners of the Alliance defense aspire to spending two percent of GDP. The Chancellor stressed, however, on Tuesday that by 2024, 1.5 percent would be achieved. The Deputy FDP Chairman Wolfgang Kubicki, meanwhile, demanded in unusually sharp words, an immediate expulsion Grenells. "Who is acting as a U.S. Diplomat as a high Commissioner of a occupying power, must learn that our tolerance also knows the limits," said Kubicki, the AFP news Agency. He appealed to foreign Minister Heiko Maas (SPD) to explain Grenell "immediately persona non grata". Criticism of the Remarks of the Ambassador came also from the coalition: the Parliamentary Secretary of The SPD parliamentary group, Carsten Schneider, said Grenell was a "diplomatic total failure". You can feel the "posturing of a Flegels" reminds. the Parliamentary Secretary of The Union group, Michael Grosse-Brömer said, if Grenell my already to the German budget comment, then he should keep the "wide view". Germany, which inserts foreign and international responsibility regards, to many commitments. The CSU land group chief Alexander Dobrindt rejected the interference Grenells. The budget was "a sovereign decision of the Federal Republic of Germany and of the German Bundestag". In terms of content, he said, but also criticism of the medium-term financial planning. The defence budget has already increased significantly in recent years, and now is presenting in the basic Parameters for the budget in 2020, the Scholz this Wednesday to the Cabinet, again a significant Plus intended. Scholz has agreed with defense Minister Ursula von der Leyen (CDU), your Department in the coming year to 45.1 billion euros – 4.4 percent more than this year. This is equivalent to 1.37 percent of Scholz on the Basis of the current growth forecast of expected gross domestic product for 2020. It can be more but also less. According to the financial planning of the Minister of Finance should be reached in 2020, but also the preliminary peak in the Highlight. In the years from 2021 to 2023, the Highlight is moved back to a good 44 billion euros. Thus, the Nato-rate gradually drops to 1.25 percent, because the gross domestic product is growing. It would not grow, or less, would be the Nato ratio is slightly higher. Financial planning is a regular part of the budget act, but it also changes every year based on the current growth forecast, which underlies the planning. How high is the defence budget by 2023 will actually be, how high is the gross domestic product will be then, and so at the end of the Nato-rate, the first in nearly five years.